Happy Monday!! Last weekend I took a quick weekend trip to NYC. I enjoy these trips to the city because its a great change of scenery and I get to visit my little brother. Today I’m sharing a few highlights from my trip, which basically is all the food spots I went to because that is all I do in NYC – EAT! I got into NYC early Friday evening and went to dinner at Stella 34 Trattoria. The restaurant is located on the 6th floor of Macy’s Herald Square. The food is delicious and the service is excellent! I went with the classic Margherita pizza, which totally hit the spot! The best part was the gelato straight from Florence, Italy. I couldn’t believe it was gelato from Vivoli Gelato of Florence, I’ve actually been there and I’m obsessed with the gelato. The food was excellent, sadly I was too hungry and exhausted to take photos of our meal, but trust me it’s totally insta-worthy! On Saturday I started my morning out in SoHo and stopped by M. Gemi to try on a few shoes. I adore the brand and own a few pairs from them (see here and here) and wanted to get fitted in their sandals and heels. I bought a cute pair of white sandals for an upcoming beach wedding that I’m super excited about. After some shopping I met up with some of my insta friends at Laduree in SoHo. I’ve been friends with these gals for years on IG and it was so nice to finally meet up with them!! 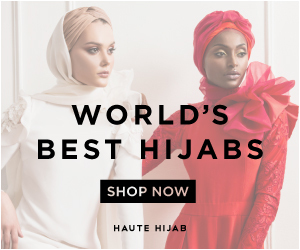 Melanie (@hautehijab) is the CEO and founder of Haute Hijab. Thanks to her my hijab game has been going strong since 2010! Heba (@heba_jay) is a fashion blogger from Michigan and we have so many mutual friends! Fatima (@fatimaibrahim27) is from Chicago and she is an optometrist who also has the BEST IG FLAT LAYS EVER!! Her page is so insisting and she is just a sweetheart! Israa (@israaodeh_) is an NYC native and we connected on IG and have been friends since! I has such a blast meeting up with these inspiring ladies and getting to know them better. It’s amazing how we were all friends virtually but felt like we’ve known each other for ages! The best part of the weekend was getting a facial at Caudalie Boutique Spa. My sister and bro-in-law were sweet enough to get me a facial for my birthday. My aesthetician, Natasha, was absolutely amazing! I am a huge fan of Caudalie and use a ton of their products for a few years. The facial had my skin glowing! She gave me such great advice on my skin and recommended an eye cream. I’ve been using it for the past week and I’m super happy with it. I will be doing a separate blog post sharing more details on all the products I picked up! For dinner we went to Cafeteria followed by dessert at Spot Dessert. We walked to both places to work up our appetite and walk off our dinner before eating dessert. Everything we had was delicious!!! I highly recommend the Mac & Cheese Spring Rolls from Cafeteria. At Spot Dessert we opted for the tapas menu and got The Harvest, Tropical Cheesecake, and Cookie Camp. All there desserts were delicious! On Sunday we had lunch at Fish Cheeks followed by a walk to La Churreria NYC from some delicious Nutella Churros. From there we walked to Magnum NYC and had the most delicious customized ice-cream!